It could be considered a case of turn-around being fair play. After appearing in several Yasujiro Ozu films as a daughter needing to be married off, Setsuko Hara finally played a mother trying to make matrimonial arrangements for her own daughter in Ozu’s Late Autumn (trailer here), which screens tomorrow at the IFC Center as part of their ongoing Ozu weekend series. Though ostensibly based on different source novels, Autumn is clearly a reworking of Ozu’s Late Spring, with Hara assuming the role of the single parent, Akiko Miwa. 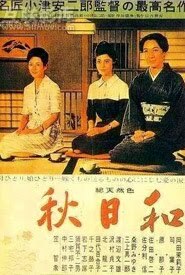 It is about time her daughter Ayako married and moved out, but the dutiful young woman refuses to leave her mother by herself. However, instead of a gossipy aunt, Akiko has the dubious help of three of her late husband’s old cronies. When the source of Ayako’s objections becomes clear, one of them even starts to get ideas regarding her mother, noting how attractive she still is (yeah, no kidding, she’s Setsuko Hara). 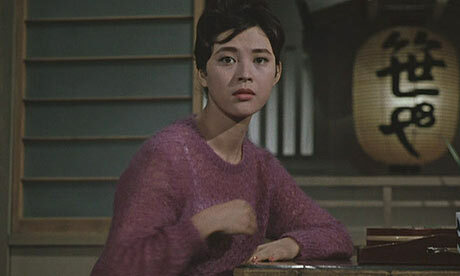 Autumn is one of the films that truly immortalizes Hara’s image as a paragon of virtue. Ever dedicated to her daughter in life while loyal to her husband in death, she personifies domestic goodness. She is also still a radiant screen presence. In contrast, Shin Saburi brings the curmudgeonly charisma in spades as her husband’s friend Soichi Mamiya, essentially reprising his gruff but warmhearted persona from Equinox Flower. Mariko Okada, dubbed “Mad, Bad, and Dangerous” by a Japan Society retrospective earlier in the year, is really none of those things as Akiko’s best friend Yukiko Sasaki. Still, there are times the busybody middle-aged men of Autumn would beg to differ, but her on-screen charm is always totally winning. Though the parallels with Spring are inescapable, Autumn still holds up on its own even for those who truly adore Ozu’s 1951 masterpiece. Switching Ayako’s surviving parent to a mother (particularly o ne played by Hara) certainly increases the pathos of their natural parting. Yet, nothing can approach the bittersweet beauty of Spring’s final moments. As usual, Autumn is punctuated by Ozu’s peaceful transitional shots of home and hearth. A sad but gentle film, it perfectly represents his themes and motifs. It is also underscores Ozu’s stature as the preeminent artistic chronicler of Japan’s middle class, at a time when many were trying to maintain their traditional values while simultaneously enjoying a hard-earned prosperity and respectability. Though maybe not quite the transcendent masterpiece of Spring, Autumn is still a wistfully elegant classic. Recommended as a top-tier Ozu film, it screens this Friday (10/22) through Sunday (10/24) at the IFC Center.